The head of the German Bar Association (DAV), Ulrich Schellenberg, said the rule of law no longer exists in Turkey, warning German lawyers about the possibility of being arrested in the country, Deutsche Welle reported on Friday. “There is no rule of law in Turkey anymore. There is no presumption of innocence. There is no effective defense. 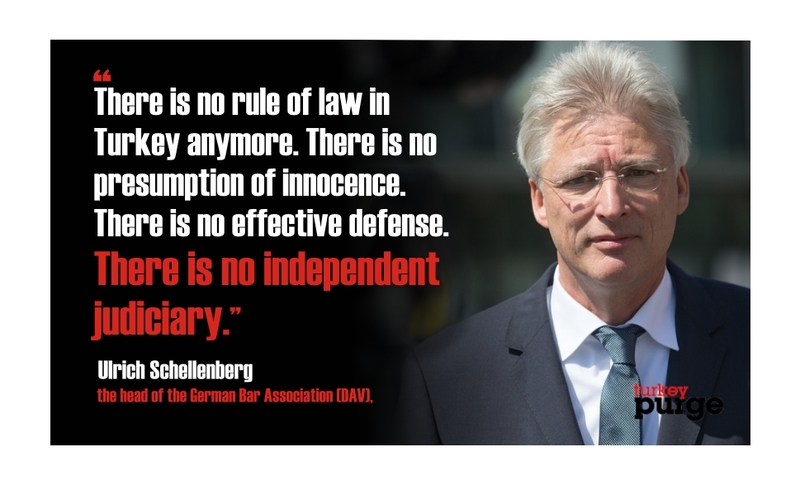 There is no independent judiciary,” Schellenberg told dpa, underlining that lawyers have been detained due to their clients and that people are having difficulties finding attorneys. Stating that Turkish President Recep Tayyip Erdoğan is trying to create a “fear system” among judges and prosecutors, Schellenberg described this trend as poison for the independent judiciary. Regarding the mass detentions in Turkey, Schellenberg said Turkish authorities impose arbitrary detentions, warning that German lawyers could be arrested just like German journalists in Turkey. Schellenberg in June criticized the European Court of Human Rights (ECtHR), which rejected applications concerning post-coup worker purges in Turkey on the grounds that domestic remedies had not been exhausted. Schellenberg said there was no working state of law in Turkey and that Turkey could not be compared to other European countries in terms of state of law principles. The Turkish government started a crackdown on the opposition in the wake of a botched coup attempt on July 15, 2016 and arrested more than 50,000 and dismissed or suspended around 150,000 judges, teachers, police and civil servants. A total of 524 lawyers have been arrested and 1,342 are under prosecution since the coup.